For those with a more adventurous side, kayaking can be a great way to get a workout while simultaneously appreciating the beauty of nature. For those that have been out with a kayak before, you might remember how bulky and awkward they can be to get from point a to point b.
Fortunately for you, many companies have come up with their own unique designs to cart your kayak, in many cases simulating a second carrier.This will allow you to travel even considerable distances with ease, even with some of the heaviest of equipment. So, with all of the products out there that you can choose from, how will you ever decide which one stands out from the pack? You needn’t worry, by reading this you will be introduced to a total of ten excellent choices, helping you to choose the best kayak carts for you and your friends. Many, many hours went into this process. It began with pulling together the opinions of countless experts and experienced kayakers. After filtering through the best options from these suggestions, it was time to get some hands-on experience with the carts that have been left in contention. We meticulously poured over each and every feature, what some carts had that others didn’t, which ones seemed like a great value, and more important considerations. Ultimately, when we were done testing and grading, we were able to choose the ten best kayak carts that are universally appealing. From these ten, the list was ranked in order of functionality, price/quality ratios, and the accounts of real users who are literally working these particular carts on a regular basis. 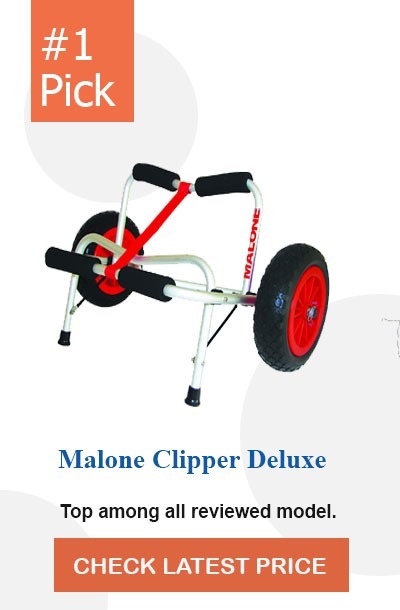 If you are looking for an excellent cart that can help you move your kayak with ease, the Malone Clipper is perhaps the best choice for you both in terms of value and functionality. With its heavy load limits and convenience features to keep your kayak or canoe protected and safe, it is no wonder why this product has the kind of buzz that it does. Removable 10” tires that are airless. Never worry about getting a flat tire on your cart again, or worry about the difficulty of changing out tires throughout the life of the cart. Tie down straps are included with purchase. These ensure that your precious cargo stays put. Frame is universally constructed to be used with all sizes of kayaks and canoes. It also features an impressive 200 lb. weight capacity for what you have to haul. The frame is padded, ensuring that you can keep your kayak from being tossed around and damaged. Easily coming in as one of the most affordable of the options on this list, this cart is a bargain shopper’s dream. With impressive convenience features and limited assembly required, this is certainly a cart worth taking a closer look at. From its aluminum and stainless steel construction to its all-terrain tires, this heavy duty kayak cart is built to last and to go anywhere that you need it to. Appreciate the strength and stability of this aluminum and stainless steel creation. Lightweight and durable, this cart is able to haul upwards of 150 lbs. regularly without bogging down. A spring-loaded stand on the cart can really aid in you easily loading up the kayak directly from the water. All-terrain pneumatic tires can handle all kinds of situations. While they will run smoothly on pavement, these tires are also able to effortlessly move your kayak over less stable ground like sand and gravel too. Protect the hull of your kayak or canoe with the integrated foam bumpers. This will prevent jarring while traveling. There is no denying the impact that TMS has had on small boating and kayaking accessories. This is evident with this particular cart, a reasonably priced multi-pack of trolleys worth investing in if you have to move more than one kayak. Loaded up with convenience features and incredibly easy to use, these carts might just easily win you over. Two is better than one, and that is very evident in this dual pack of carts. Now you have twice the towing ability at a very, very reasonable price. Each of the carts is able to support a load of 150 lbs. 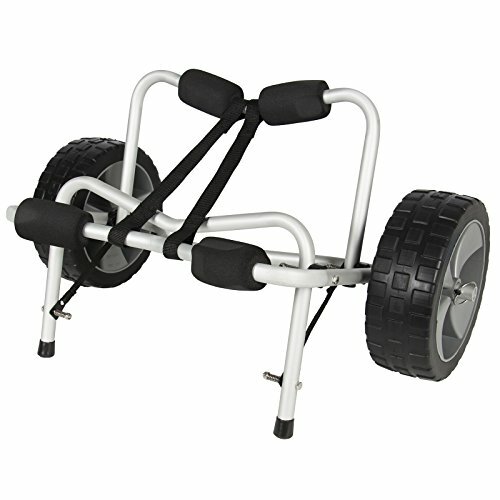 That means that even your most stout of kayaks can be easily handled by this small and versatile cart. A spring-loaded stand can help to give the kayak stability when you have to stop on your short trip to the water, or remain ready to receive your kayak from the water when you return to shore. A v-shaped cradle that is integrated with padding allows for your kayak or canoe to remain stable and without damage throughout its transportation. If you were looking for a cart that was both easy to use and easy to assemble/disassemble, this is going to be the cart that you will certainly consider. While it might not be loaded up with a lot of bells and whistles, it does over a generous towing capacity and tires that are guaranteed never to go flat on you. Feel the ease of pulling a cart that has the towing capacity in excess of 165 lbs. 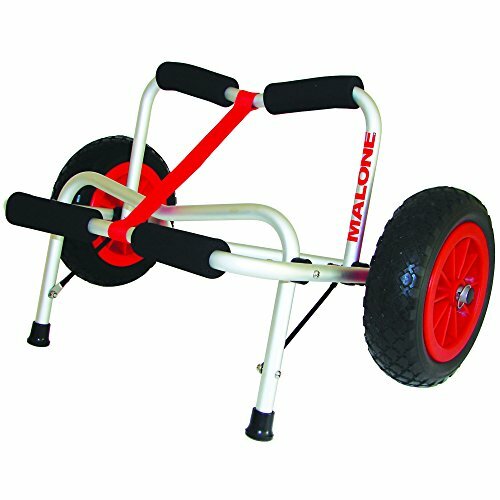 Even your most bulky of kayaks or canoes can easily be transported by this cart. Solid tires made entirely of rubber help to glide you over uneven terrain with ease. Additionally, these tires are not able to go flat, so you won’t need to regularly replace them. It is very easy to put this cart together and to take it back apart for storage reasons. A built-in spring-loaded 10” stand allows for more stability when you stop moving and a secure point on the shore to help easily prepare it for traveling back. If you wanted some versatility in a small package, SUP Wheels has just the product for you. 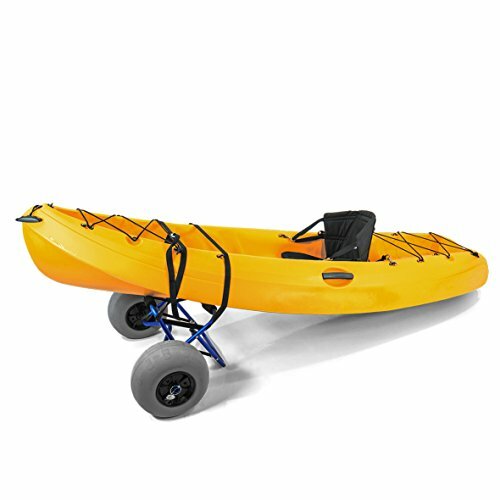 While this might be advertised more towards those looking to move paddleboards and windsurfers, its unique design and convenience features make it entirely ideal for kayak transportation as well. All-terrain style 14” tires make going over uneven surfaces like sand and rocks a snap. Aircraft-grade aluminum frame is light and durable, and the entire cart is built to withstand even the most damaging of elements. 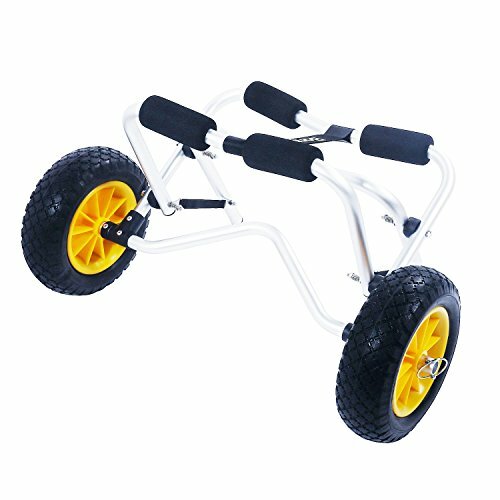 You can easily fold the cart into an easy to carry package for storage or to keep with you as you go. Tires are designed to never go flat, which means that you can be assured of many years of effortlessly using your new cart. Best Choice Products has put out a very solid cart here for your consideration. While it might not have a slew of jaw-dropping features, what it does have, is a lower price tag and a track record of success among its customers. This is something that could appeal to both the experienced kayaker, and those that are just starting to find their stride. Appreciate the lightness and rugged durability of an all-aluminum construction. Foam wheels are guaranteed to never go flat. 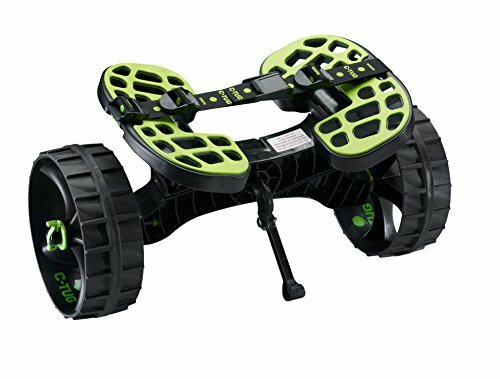 The 10” wheel is also designed to easily move through all kinds of terrain that a kayaker might have to encounter. Make sure your kayak is secure by using included 12 ft. strap. No kayak should have trouble being held up by this sturdy cart. It has a weight capacity of 150 lbs. This is far above the average weight of a traditional kayak. 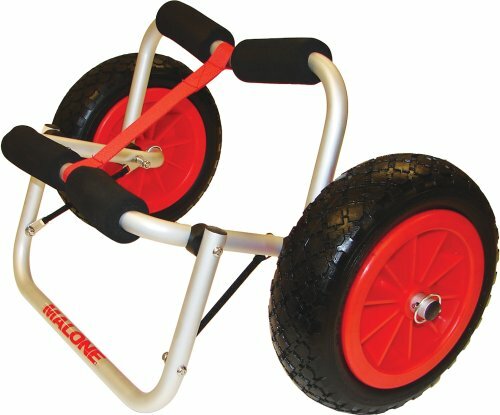 It is not entirely surprising that Malone products would make another appearance on the list of the best kayak carts that your money can buy. With their long standing high customer satisfaction ratings, it would seem that each of their carts or accessories suits the needs of the average kayaker completely. Lightweight and rigid aluminum frame makes the cart easy to handle and carry, but strong enough for even your most serious of loads. Rest your kayak inside of the frame and trust that it is protected. The frame itself is oversized and padded, ensuring that even the largest of kayaks will be protected. Convenience features like tie down straps and a locking kickstand offer more versatility than many of the best kayak carts out there. Trust in your 10” tires. These are built to never go flat, which gives you a peace of mind over a long trek with your equipment. Built to get you where you want to go quickly and easily, this Suspenz cart is certainly an impressive piece of equipment. Starting with the tires that are designed to stay as strong on day one as they are years later, you will appreciate never changing a cart flat tire again. Experience the power and light weight of an all-aluminum frame. Completed with stainless steel hardware, this is a cart that is built to last. Protect the hull of your kayak or canoe with the rubber bumpers. These will last longer than traditional foam padding. Airless 10” tires are built to never go flat and to handle whatever terrain they need to. Perhaps the most unique looking cart/trolley on the entire list is the Ctug. While it is among the pricier of the options on this list as well, it isn’t without a pretty good set of reasons. This is a very different looking piece of equipment that is loaded up with all of the benefits and features that you have been hoping to see. Unparalleled weight capacity. 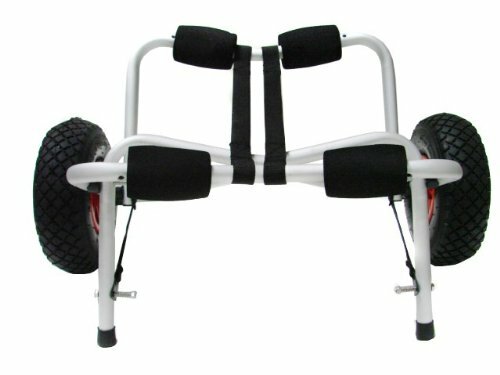 Able to support upwards of 300 lbs., this cart can do more than several of these carts combined. High grip rubber tires help to give you traction and stability on any terrain, and the tires are designed with ‘puncture proof’ technology. Lightweight and durable, this is one of the few carts on the entire list that is only 10 lbs. unloaded. Easily assemble and disassemble your cart without the need for a single tool. While it might be last on this top 10 list, this cart still has quite a lot of reasons why it is worth your consideration. Boasting some impressive features (with a price to match its bells and whistles), Challenger Outdoors has created a product that can handle a lot of wear and tear. Lightweight frame makes transport of the cart a snap, and makes the set up for moving your kayak even easier. V-shaped frame holds kayaks and canoes easily. It simultaneously protects the hull from damage with the foam padding within the V.
Large 12” low-pressure balloon tires glide over uneven and rocky terrains with ease. 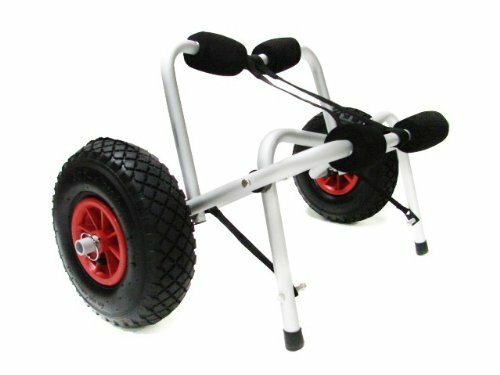 Included pump allows for easy inflation (or re-inflation) of tires wherever you might be. While the concept might be simple and basic, not every cart that you come across is going to be the same. With so many varying designs, brands, prices and more, how do you choose among what’s out there? It begins with understanding what you need your cart to be able to do and the ease with which you can do that. While budget/cost concerns might creep up into importance as you choose among the top options listed below, this shouldn’t be your primary selling point. There are actually many different looks, styles, and materials that these various carts are constructed from. Sustainability and sturdiness are both important concerns as well, as you want to ensure that the money you have spent for the equipment ends up being a sound investment. Carrying your kayak doesn’t have to be a chore or a two-person task any longer. With the aid of any one of these carts, you could be conveniently and easily transporting your vessel to the water. 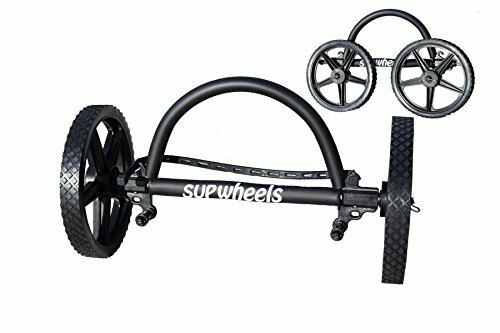 While there are clearly some of these carts that have better prices (for those looking for value) or better features (for those seeking the best kayak carts out there), each of these listed above should be a consideration for your upcoming purchase. [UPDATED] Best Two Way Radios for Hunting-Don’t Buy BEFORE Reading This! There are few types of game I haven’t hunted or fish that I haven’t pulled from the water. Regardless of your hunting knowledge or fishing prowess, my experience can help you to be better and score bigger game and fish no matter where you live.